Jarrod is looking forward to offering a prefest course this year focusing on advanced spoon carving. He will cover all the basics of spoon carving as well as explore advanced knife grips, creating and improving spoon designs, finding and carving crooks, and the subtle art of micro-decoration. If participants choose to, they can bring their spoons in for group critique sessions. Jarrod Dahl is a full-time craftsperson, teacher, and writer who has worked with wood professionally since 1996. 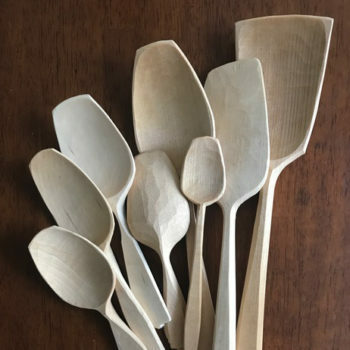 He currently makes and sells fine domestic woodenware at www.woodspirithandcraft.com and specializes in turning green wood into end-grain cups, boxes, and bowls, as well as carving spoons and cooking utensils with axe and knife. 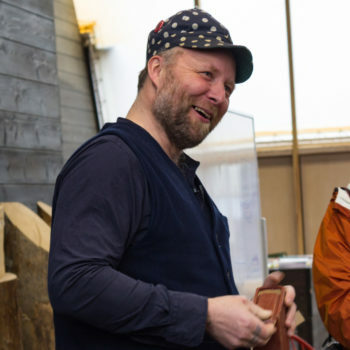 He teaches handcraft nationally and internationally including at the Center for Furniture Craftsmanship, North House Folk School, Port Townsend School of Woodworking, Greenwood Guild London, and Plymouth CRAFT. His studies and research in museum archives in the US, Sweden, and the UK have influenced and inspired him as a craftsperson. Jarrod has extensive knowledge of harvesting natural materials, the use of hand tools, and a deeper philosophical, historical and pragmatic approach to handcrafts. He has a DVD with Popular Woodworking Magazine, The Art of Spoon Carving and is currently writing a book on pole-lathe turning with Lost Art Press. He is a recipient of the Coperthwaite/Sundqvist Slöjd Fellowship Award in 2016. He lives and works in Ashland, WI.